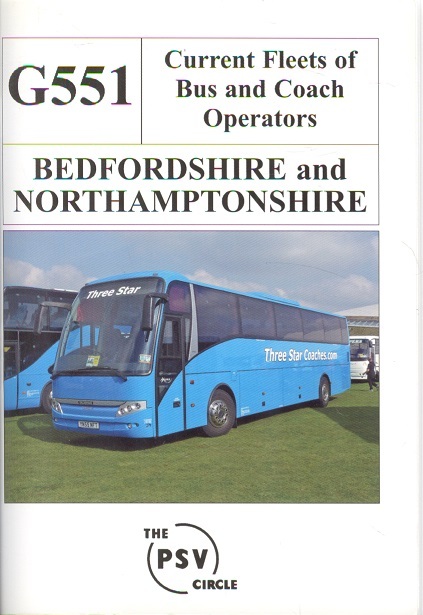 G551 - Current Fleets of Bus and Coach Operators - Bedfordshire and Northamptonshire. G551 - Current Fleets of Bus and Coach Operators - Bedfordshire and Northamptonshire.. The PSV Circle. The PSV Circle, 2010. First Thus. ISBN: . 87 pages. 170g. stapled soft card covers Near MINT. Illustrated with colour photogrpahs. details known operators of bus fleets in the areas of Bedfordshire and Northamptonshire.